Welcome! In this 12-month master class led by Design Team member Meghann Andrew, we will delve into the world of pocket page scrapbooking—the perfect place to combine photos, words and your favourite paper crafting products to tell your stories alongside your traditional scrapbook layouts, or in their own dedicated album. On the second Monday of each month, starting on January 14th, you will receive access to a deep-dive, printable PDF lesson from Meghann on the topic for the month, which will be backed up with her exclusive, new pocket page projects, so that you can tie the themes that we’re discussing to actual pocket page layouts. Then, on the fourth Monday of the month, one of our fabulous guest designers will share more inspiration with you, aligned with our monthly topic, to keep you creating with the tools that you have learned. 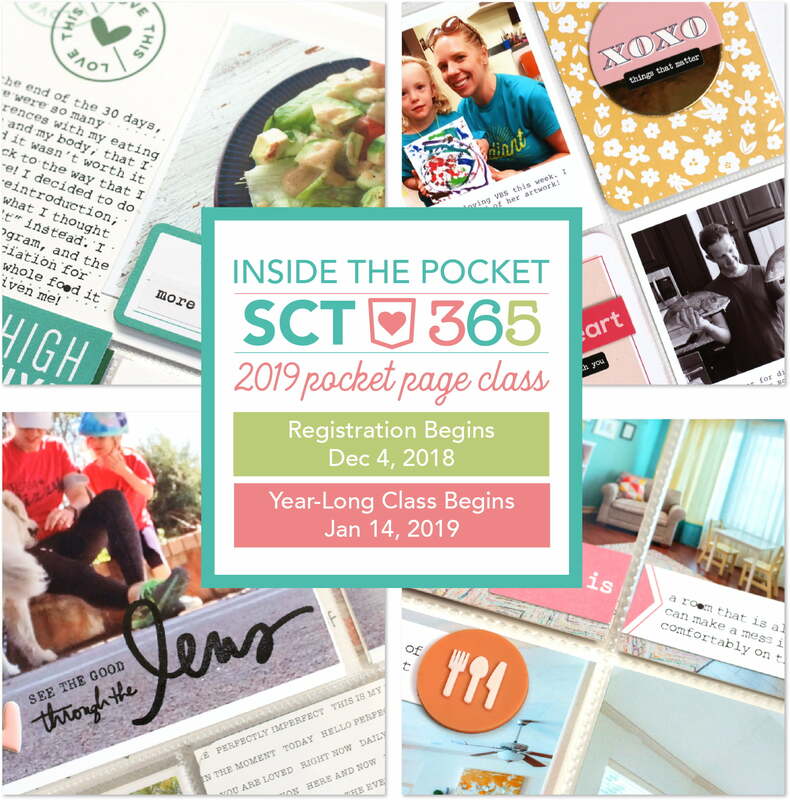 By the end of the year, you should have a completed pocket page album and the knowledge to feel like a pocket page rockstar—all for less than $3 per month! We can’t wait to see how you fill your pockets! Guest designers include experts Jess Forster, Pam Baldwin, Lisa Varshine, Nathalie Leonelli and Sarah Zayas! On the 14th of each month, the new content will be available to you in the online classroom on the SCT website. Best of all, the content is available to you all year long so YOU can set the pace for this class. This class starts on January 14, 2019. Are you ready for the amazing price? Only $35 for this complete year-long class! 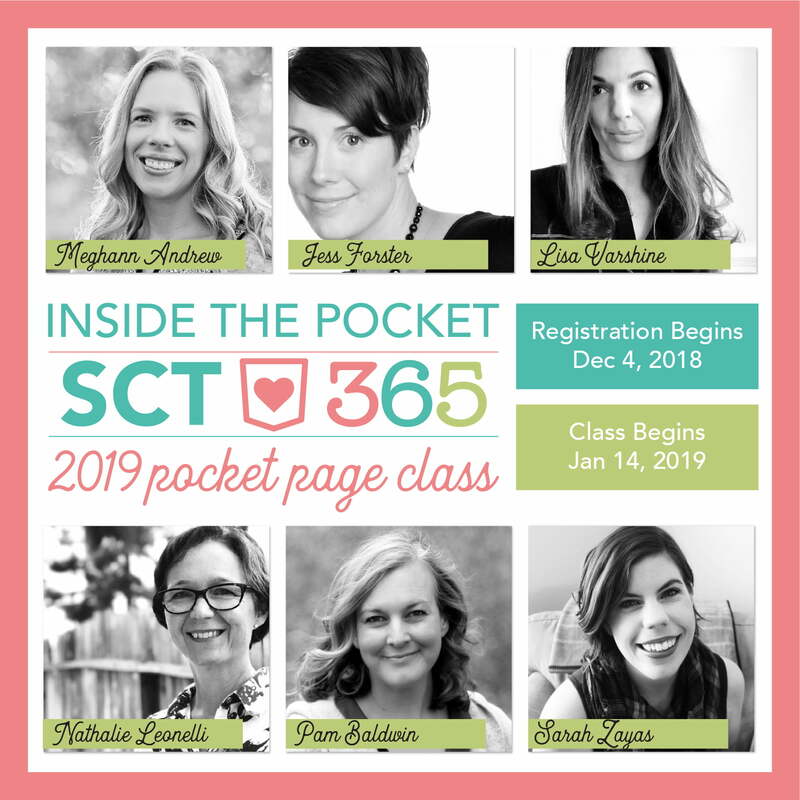 Learn more about the SCT365 Inside the Pocket online class by watching this video.